GH IA founder Dale Wilcox answers the questions most often asked about the company and induction heating technology. "The induction coil is cool to the touch; the heat that builds up in the coil is constantly cooled with circulating water." "Yes you can, but the nitrogen has to be clean and have a low dew point." "Sure, in fact induction heating is preferable for diamonds bits because it works so quickly. The longer the diamond remains at heating temperature, the faster it degrades. We recommend atmospheric brazing in a vacuum atmosphere for the best results." How do I select a braze alloy? "We've put together a Brazing Alloy Selection Guide to help you choose the best option. It depends on the composition of your part, how and where it will be used, and the joint strength required. Another helpful service we provide for our customers is to put them in touch with an experienced braze alloy supplier." How can we set up a leaner operation? "The best thing you can do is unplug those old furnaces and invest in a quick, clean vacuum induction system. Our new compact induction vacuum furnace will fit right into your manufacturing cell." "Yeah, we get that question a lot. It depends on the geometry of your part and how you want to heat it. If you have a part with simple geometry and your process calls for heating a specific area of the part, direct induction heating will generally be preferable. However, if you need to heat the entire part, or if the part has a complex shape, then you'll achieve better results with an induction heating vacuum furnace." "Not likely. Induction heating is a very effective, efficient means of heating. Most of our customers who are switching to induction for the first time see their utility bills go down." "Of course it depends on the system, but a typical typical system requires 440, 3-phase VAC at 60 Hz and 30 Amps. Also figure on 80 PSI compressed air and 40 PSI water at 4 gallons per minute for cooling." "If you work with glass or ceramics, a compact vacuum furnace is a great solution for brazing. You'll get quick, clean heat with very precise temperature control." Can induction be used to nickel braze in nitrogen? I am using an induction system to heat a graphite object under a nitrogen atmosphere with pressure of about 100 microns. I am seeing a glow around the coil. This does not seem normal, and the current draw seems high. Can you explain why this is happening? How long does it take to build a system? "We can build our standard systems, like our compact VF-20 Vacuum Furnace or our Bell Jar Heating Systems, in ten weeks. Custom-designed systems currently have a 16-week lead time." Where is your largest installed base? Do you install the systems you sell? "Absolutely. Every system quote includes installation, operator training, crating and shipping. All we ask is that you uncrate the system and move it into position before our service engineer arrives." "Our company was incorporated in 2002, but our core engineering team has been working together and building turnkey systems since 1998." Do you have in-house manufacturing capability? What PLCs do you use in your systems? "We'll work with whatever our customers need. Our engineers have experience with Allen Bradley, GE Fanuc, Modicon, Automation Direct, Xycom, Omron and more." Why wouldn't it be less expensive for us to build the system in-house? 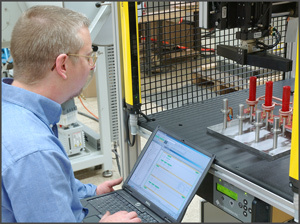 "When you talk about building your system in-house, consider the hidden costs: the inefficiency of designing and building something for the first time (the time and money lost to the learning curve); the cost of the machine tools and specialty equipment necessary to create the custom pieces; the lost floor space and disruption of normal factory flow during the assembly process; and supporting the system after it is up and running. And don't forget the time of all the personnel involved in the project – engineers, technicians, machinists, electricians, purchasing agents, all the executives involved in the approval process. We have a great deal of experience building these systems and can deliver your system with guaranteed performance in the promised time frame."